"To avoid an all-out confrontation with Okinawa, the Abe administration needs to search in earnest for an alternative plan that will reduce the Okinawans’ base burden." Okinawa Gov. Takeshi Onaga recently paid a visit to the United States to convey to government officials and legislators, including Republican Sen. John McCain, as well as to U.S. security experts, the sentiments of Okinawans who oppose the Japanese government’s plan to build a new air base for the U.S. military in the northern part of Okinawa Island. Although the visit did not produce concrete results, it was significant that the governor directly expressed his views to U.S. officials and lawmakers, and that “they at least understood” — according to the governor — the situation in Okinawa surrounding the base issue. Onaga visited the U.S. apparently because he thought that the Abe administration — in its push to build off the Nago coast a replacement facility for U.S. Marine Corps Air Station Futenma in Ginowan — turned a deaf ear to the protests of those who oppose the project and that it would be more effective to make an appeal to U.S. officials and experts. In this sense his trip was aimed at Tokyo as well. Although Onaga was elected governor in November, Prime Minister Shinzo Abe and key members of his Cabinet refused to meet him for months. Finally, Chief Cabinet Secretary Yoshihide Suga met with him in Naha in April and Abe and Defense Minister Gen Nakatani did so in Tokyo later that month. Neither of them would answer Onaga’s question of why a new base must be built in Okinawa rather than in another part of Japan. They only repeated that construction of the replacement facility off the Henoko district of Nago is the only solution to remove dangers from the Futenma base located in a residential area of Ginowan in central Okinawa. In Washington, Onaga encountered a similar response in his joint meeting with Joe Young, head of the State Department’s Office for Japanese Affairs, and Cara Abercrombie, acting deputy assistant secretary of the Defense Department: They said the Henoko plan is “the only solution that addresses operational, political, financial and strategic concerns” and ends the continued use of the Futenma base. Both the Abe administration and the U.S. government should pay heed to what Onaga said just before and during his U.S. visit. Despite his opposition to the construction of the Futenma replacement facility in Henoko, he is not against the Japan-U.S. security alliance per se. In his meeting with McCain, chairman of the Senate Armed Services Committee, the governor said he understands the importance of the security setup. But he pointed out that while Okinawa accounts for only 0.6 percent of Japan’s land mass, some 74 percent of the bases solely used by the U.S. military in Japan are concentrated in the island prefecture. The Japanese and U.S. governments should realize that the Henoko plan represents the last straw to Okinawans bearing the U.S. military’s heavy presence and could ratchet up local resentment toward both Tokyo and Washington and the security alliance. In an interview with Kyodo News ahead of his U.S. visit, Onaga expressed the sentiment of many Okinawans when he stated to the effect that since other parts of Japan do not want to accept U.S. military facilities, Okinawa, where local residents are seen as accustomed to existing U.S. bases, has been forced to accept a new base and that Tokyo thinks it can overcome local opposition by offering government spending for development projects. He also said the purpose of the visit is “to say that building the new base at Henoko will cause considerable harm to the Japan-U.S. alliance and the security setup.” Both Tokyo and Washington should not make light of his warning. Sen. Brian Schatz, a Democratic member of the Senate Appropriations Committee’s subcommittee on defense, whom Onaga met with in Hawaii, stressed the need to review the Henoko issue in view of serious concerns that local residents have toward the plan, and pointed out that local people’s support is indispensable for any security-related project. This is a reasonable and important point. Both the Japanese and U.S. governments should stop to think about whether it is wise to push ahead with the construction of a new base in Okinawa in the face of strong local opposition. To avoid an all-out confrontation with Okinawa, the Abe administration needs to search in earnest for an alternative plan that will reduce the Okinawans’ base burden. the result of the poll on Governor Onaga's policy of seeking cancellation of the former governor's approval of the landfill. The Ryukyu Shimpo and the Okinawa Television Broadcasting (OTV) carried out a telephone poll on the U.S. Marine Corps Air Station Futenma relocation issue on May 30 and 31. According to the poll, 77.2 percent of respondents support Governor Takeshi Onaga’s plan to cancel the former Governor Hirokazu Nakaima’s approval of landfill in Henoko, Nago, if an expert committee recommends it. The poll showed that 83 percent of respondents oppose relocation of the Futenma base within the prefecture. The percentage of respondents opposed to the relocation plan is the second highest ever recorded in this survey, behind a May 2012 recording of 88.7 percent. 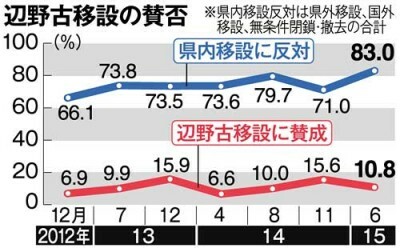 It is the highest since the Abe administration took office in December 2012.
the result of the poll on the Henoko relocation. The poll shows that criticism of the central government, which is continuing preparation work for the landfill in spite of opposition, remains strong among Okinawa people. This year’s poll falls on the 70 th anniversary of the end of World War II. The former Governor Hirokazu Nakaima previously approved the landfill plan off the coast of Henoko, Nago, reneging on an election pledge not to allow it. Governor Onaga intends to revoke the former Governor’s decision. Eighty-three percent of respondents are opposed to the relocation of the Futenma base within the prefecture.